If your ice cream goals include gelato, check out the Breville BCI600XL Smart Scoop Ice Cream Maker. 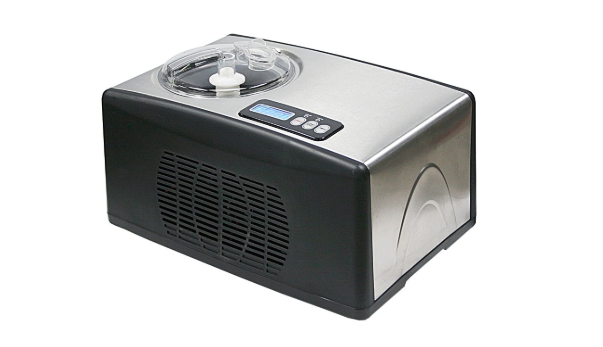 It has specific temperature and churning settings for frozen desserts including sorbet, frozen yogurt, gelato, and ice cream and can make 1.5 quarts at a time. Variety: This ice cream maker has 12 speeds and can whip up more frozen desserts than most of the ice cream makers we looked it. Easy to use: With the push of the button and the set of an alarm, you’ll have gelato in less than an hour. No mess: No ice, salt, or mess required. Simply pour your gelato base into the machine and let the Breville do the work. If you’re looking for an easy to use, easy to clean ice cream maker, check out the Whynter ICM-15LS Ice Cream Maker. This compressor machine is self-refrigerating and makes delicious, smooth ice cream. Plus the machine is easy to clean. Ease of use: This is one of the easiest to use ice cream machines we’ve come across. No mess: No need for ice and salt – simply turn this ice cream maker on and you’ll have ice cream in 30-40 minutes. If you love frozen yogurt, you’ll love the Cuisinart ICE-21. It has a double-insulated freezer bowl and an easy lock (and transparent) lid so you can watch your ice cream churn. It also features a spout through which you can add flavors or other ingredients while the frozen yogurt churns without having to stop the freezing process. Easy to use: Simply add your ingredients to the bowl and hit the “on” button and wait approximately 20 minutes. Easy to clean: Removable, dishwasher safe components make clean up take just minutes. Looking for an affordable ice cream maker? Check out the Nostalgia ICMP400 ice cream maker. It’s a traditional salt and ice ice cream maker, but features a motor rather than requires manual mixing. Price: This ice cream machine costs less than $50 and produces great tasting ice cream. We love a good pint of Ben and Jerry’s ice cream (especially Phish Food), a sundae made with Mayfield’s vanilla, ice cream shakes made with Breyer’s chocolate, and pretty much every other brand, flavor, and dessert that involves ice cream. And we particularly love homemade cream. While store-bought is delicious, there’s just something extra special about home-churned ice cream. Have you tried making ice cream before? Many people shy away from it because they think it will be too difficult or messy, but the truth is it’s simpler than you’d imagine. Especially if you have a good ice cream maker. 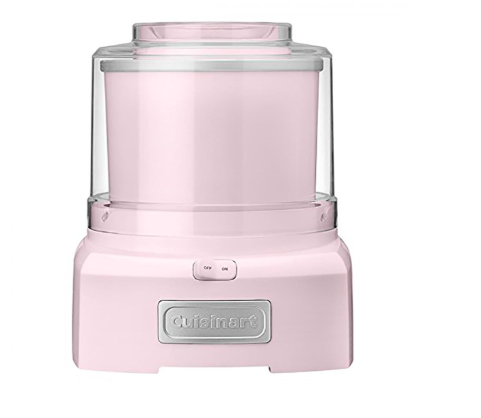 If you’re looking for an easy to use, easy to clean ice cream maker, check out the Whynter ICM-15LS Ice Cream Maker. This compressor machine is self-refrigerating, meaning you won’t need to deal with ice and salt or even freezing a bowl 24-hours in advance. It makes delicious and smooth ice cream, is easy to scoop from, and super easy to clean. Ease of use: This is one of the easiest to use ice cream machines we’ve come across. An LCD timer control & temperature display help walk you through the process. No mess: No need for ice and salt – simply turn this ice cream maker on and you’ll have ice cream within the hour. Ability to make back to back ice cream flavors: No need to wait until the bowl refreezes. You can make as many batches of ice cream as you want! Variety: Enables you to make sorbets, gelato, sherbets, frozen yogurts and more. If you’re new to the homemade ice cream world and aren’t sure how often you’ll be making it, you likely don’t want to spend a fortune on an ice cream machine. The good news? You can still get a great quality ice cream machine at an affordable price. The Nostalgia ICMP400 is a traditional salt and ice ice cream machine. You’ll need a bunch of ice and a bit of rock salt to get it going, and the result won’t be as smooth as other ice cream machine, but the taste is still great. Messy: This kind of ice cream machine can get a bit messy, so we recommend using it outside. Durability: Unlike other ice cream makes which are made of stainless steel, this is comprised of plastic, which will not be as durable. If you love soft serve and would prefer making your own soft serve ice cream rather than scoopable ice cream, check out the Cuisinart ICE-45 Mix It In Ice Cream Maker. Not only does it produce great ice cream and is easy to use, but it’s also affordable. The only downsides are the need to plan in advance, as you’ll need to freeze the bowl 24 hours in advance. It’s also a bit small capacity-wise, but makes up for these negatives in fun: it has mix in compartments where you can store your favorite sprinkles, Oreos, or other toppings. Plus? At 10″ x 8″ x 17″, it won’t take up a lot of counter space. Advance planning required: Frozen bowl takes 24 hours to freeze so you must plan night before. Gelato is pretty different from ice cream, so if you want an ice cream maker that specializes in gelato, you’ll actually need a gelato maker or an ice cream maker with a specific setting for gelato. Gelato is made from a base of mostly milk and sugar, with a touch of cream and little or no egg yolks. It needs to churn slower than ice cream and at a higher temperature. When finished, it’s more similar to custard than ice cream. Thus, if your primary goal is making gelato, check out the Breville BCI600XL Smart Scoop Ice Cream Maker. We’ll preface this by saying it’s expensive, so you want to be certain you’ll use it before investing in it. But what sets this ice cream maker apart from competitors is its settings. It has specific temperature and churning settings for frozen desserts including sorbet, frozen yogurt, gelato, and ice cream. It has a capacity 1.5 quarts. 12 Settings: Ice cream, gelato, sorbet, and other frozen desserts require different temperatures and speeds. This ice cream maker has 12 speeds and can whip up more frozen desserts than most of the ice cream makers we looked it. Easy to use: No physical labor requires. With the push of the button and the set of an alarm, you’ll have gelato in less than an hour. 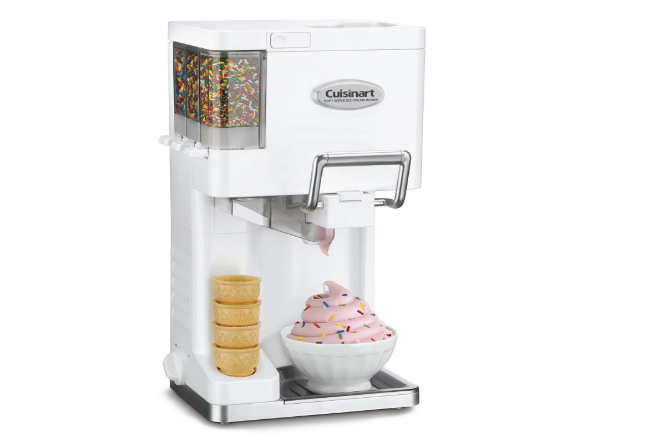 If you love frozen yogurt, check out the Cuisinart ICE-21. 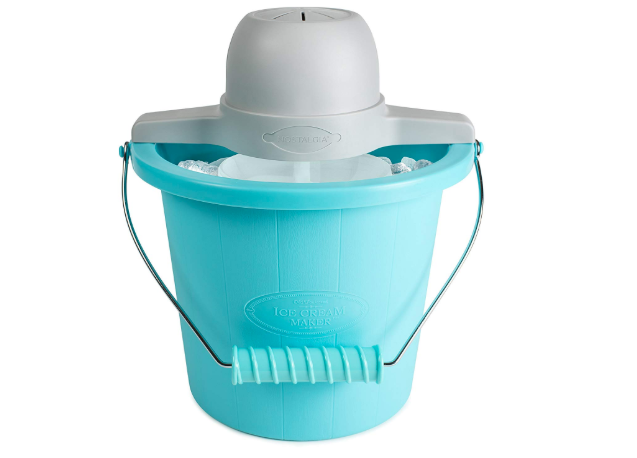 It has a double-insulated freezer bowl, a heavy-duty ice more, and an easily lock (and transparent) lid so you can watch your ice cream churn. It also features a spout through which you can add flavors or other ingredients while the frozen yogurt churns without having to stop the freezing process! Easy to use: Simply add your ingredients to the bowl and hit the “on” button and then sit back and wait. No salt or ice required. Charitable component: Frozen yogurt machine is pink in honor of breast cancer awareness. This year, Cuisinart is donating $32,500 to the Breast Cancer Research Foundation. Before we get into the different types of ice cream makers, let’s talk about how ice cream is made. Did you know there’s more than one way to make ice cream? It’s a bit more complicated than just freezing some milk and sugar and it all begins with an ice cream base. What’s An Ice Cream Base? Custard Base: A custard base is a classic ice cream recipe similar to homemade custard or pudding. To make this base you’ll need to first cook egg yolks with cream and sugar. The result? A creamy, rich, ice cream. Philadelphia-Style Base: Not a fan of eggs in your ice cream? The Philadelphia-style base may be the best ice cream base for you. This base is made with sugar, cream, and flavor. Whereas a custard base ice cream gets its fat content from the eggs and cream, the Philly base gets its fat from the cream. The result? A smooth, delicate ice cream that isn’t as rich as a custard base ice cream. Egg-Free Base: Similar to the Philadelphia-style base, this egg-free base is free of egg yolks and instead relies on cream for the fat content. Additionally, it uses cornstarch to thicken the base, and a bit of cream cheese to make the base rich and smooth. Once you create a base, you’ll use an ice cream maker to blend tiny air bubbles into the base (called “overrun”). This overrun then combines with a blend of fat from the milk and sugar and ice crystals to form ice cream. When you add salt to ice, it lowers its freezing temperature and creates a solution somewhere between 8 degrees Fahrenheit and 12 degrees Fahrenheit. This temperature is perfect for making ice cream and “salt and ice” are the original ice cream makers. Have you ever seen old fashioned, hand-cranked ice cream makers? They featured a canister filled with an ice cream base set inside a bucket of salted ice. A handle was attached to the exterior, and cranking the handle caused a paddle inside the canister to spin and create ice cream. These were the original salt and ice chilled ice cream makers. Nowadays, most handles have been replaced with a machine and an “on/off” button, but the concent is still the same. You won’t get the creamiest ice cream (especially if you invest in the old fashioned hand-cranked ice cream maker), and the process can be messy. However, this type of ice cream maker tends to be one of the most affordable on the market. Price: Salt and Ice Ice Cream Makers tend to be more affordable than other kinds of ice cream makers. Messy: Ice cream can overflow and hands can get sticky. We recommend using this kind of ice cream maker outside. Texture: Salt and Ice Ice Cream Makers tend to make lumpy, unsmooth ice cream. Some people like this texture while others don’t. Take a lot of ice: You’ll not only have to purchase the ice cream ingredients, but you’ll likely need to purchase ice (and salt) as well. As such, this type of ice cream maker typically requires a bit of advanced planning (or a lot of storage room in your freezer). Physical labor: If you purchase a manual crank machine, be prepared for some hard work! Freezer bowl ice cream makers are the most popular type of ice cream makers. They come with a removable, liquid-filled insert bowl that must be frozen solid at 0 degrees Fahrenheit before use. Once the bowl is frozen, put your ice cream base inside the bowl, place the bowl in the ice cream machine, plug it in and simply turn it on. The machine will do all the work. If you’re the type to make food or desserts last minute, this won’t be the best ice cream maker for you, as the canister typically takes somewhere between eight and 24 hours to fully freeze. The pre-frozen bowl also prohibits you from making more than one batch of ice cream at a time, and typically only produces one or two quarts at a time. Easy to use: There’s not manual labor required. Simply turn the machine on and you’ll have ice cream within minutes. Clean: This type of ice cream maker is much cleaner to use (and clean up) than salt and chilled style ice cream makers. Ice-Free: Because the bowl is frozen, you won’t need a lot of ice (or salt) on hand. Planning required: If you decided at 3:00 in the afternoon you want ice cream for dessert, you’ll be out of luck with this type of ice cream maker as the bowl can take up to 24 hours to freeze. Minimal ice cream: Unfortunately, this type of ice cream maker only yields a few quarts per batch. Only one batch: Because the frozen bowl needs to be re-frozen between batches, you can only make one batch of ice cream every 24-hours. Do you love to make ice cream and want the best, easiest to use ice cream maker around? 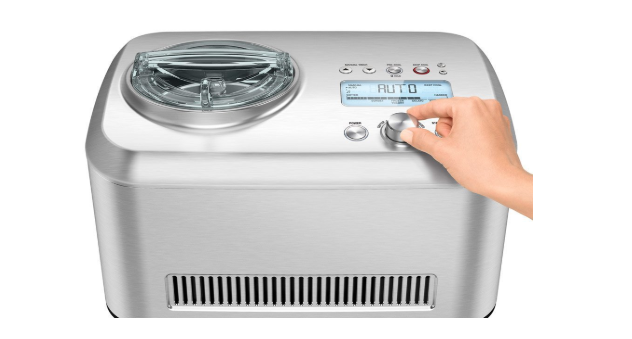 Check out the built-in compressor ice cream makers. They tend to be more expensive than other models, but they truly are the best ice cream makers on the market. Built-in compressor ice cream makers are the full package: there’s no need for salt, ice, or a pre-frozen bowl. As such, you can make as much ice cream as you want, whenever you want! Simply pour your ice cream base into the machine and let the ice cream maker do the work. This type of ice cream maker tends to make smoother, creamier ice cream than other models because the machine maintains a consistent, cool temperature which lessens the number of ice crystals formed during the process. Smooth texture: This type of ice cream maker makes the smoothest texture ice cream. Easy to use: This is the easiest type of ice cream maker to use. No prep work: There’s no need to pre-freeze a bowl or buy ice and salt. This machine does it all! Multiple batches: You can make as many back to back batches of ice cream as you want; there’s no need for downtime. Price: This is typically the most expensive type of ice cream maker. Now that we’ve taught you about the three main types of ice cream makers, do you know which is the best ice cream maker for you and your family? Selecting the type of ice cream maker is typically the first step in your purchase journey. Once you narrow type, there are a few additional things you should keep in mind including capacity, ease of use, speed and serving time, cleaning and maintenance, price, and warranty. How much do you love ice cream? Do you plan on making it as your own guilty pleasure, or will you need to share it with your entire family (or guests at dinner parties, birthday parties, or other events)? Before you purchase an ice cream maker, think about how much ice cream you want it to make. Some specialize in smaller batches (typically between one and two quarts) while others can make several gallons. Ease of use is a huge consideration when looking at any appliance, but particularly when looking at ice cream makers as some are done manually! If you think you’ll enjoy your ice cream more if you put a bit of sweat into it, that’s great, and we hope you enjoy your traditional salt and chilled, hand-cranked ice cream maker. If you love cooking, baking, and making homemade desserts, chances are you’ll love making homemade ice cream and you may not care how long it takes you to make it. If you’re not quite a Martha Stewart however, you may want an ice cream maker that produces your favorite cool treat as quickly as possible. No matter which category you fall into, it’s important to find an ice cream maker that meets your need for speed (or lack of). It typically takes between 20 minutes and an hour to whip up a quart (or gallon) of ice cream. How quickly it will be ready depends on how much you are making and what type of ice cream maker you are using. Make sure you look at the different models before purchasing to see which is the best ice cream maker for your speed and serving time needs. Some ice cream makers are messier to use than others (we’re looking at you, ice and salt ice cream makers), while others may be cleaner to use but take a long time to clean (ie, non-removable parts). Others have fully removable parts that you can simply throw in the dishwasher! If price weren’t an option, we’d tell you that hands down the best ice cream maker is the built-in compressor ice cream maker. After all, it is the easiest to use and makes the smoothest ice cream. However, the truth is that price is a major factor for most people, and unless you’re planning on making ice cream pretty frequently, have incredibly high ice-cream standards, always want “the best of the best” or frankly don’t care about money, price will be a consideration. If you want the cheapest ice cream maker, take a look at salt and ice ice cream makers. They tend to be the most affordable. If you want a middle range ice cream maker, look at frozen bowl ice cream makers. And as we first said – if price isn’t a concern – take a look at the compressor ice cream maker. We guaranteed you’ll love it. Most of the ice cream makers we looked at came with a one-year limited warranty (even the really expensive ones). This seems to be the norm, so make sure to invest in a brand you trust.